We’d love your help. Let us know what’s wrong with this preview of The Wonder of You by Susan May Warren. Mortified after her year abroad is cut short, Amelia Christiansen returns to Deep Haven, certain she isn’t brave enough to embrace the adventures she’s dreamed of. The last thing she expects is for the man who broke her heart to cross the Atlantic and beg forgiveness. Heir to a European hotel dynasty, Roark St. John has trekked from one exotic locale to another, haunted by Mortified after her year abroad is cut short, Amelia Christiansen returns to Deep Haven, certain she isn’t brave enough to embrace the adventures she’s dreamed of. The last thing she expects is for the man who broke her heart to cross the Atlantic and beg forgiveness. To ask other readers questions about The Wonder of You, please sign up. The Christiansen Family series of novels continues to be one of my very favorites. The Wonder of You does not disappoint as the latest addition. I believe that this could be read as a stand alone novel fairly well, but this series is really one that I believe should be read starting with book one, Take a Chance on Me. I had such fun reading this story and finding out more about Amelia Christiansen. She traveled through the novel in a fairly confused state, trying to figure out who was the man tha The Christiansen Family series of novels continues to be one of my very favorites. The Wonder of You does not disappoint as the latest addition. I believe that this could be read as a stand alone novel fairly well, but this series is really one that I believe should be read starting with book one, Take a Chance on Me. I had such fun reading this story and finding out more about Amelia Christiansen. She traveled through the novel in a fairly confused state, trying to figure out who was the man that she should be with. I enjoyed getting a better look at who Seth and Roark were. It is clear in the story who Amelia should choose. She seems to be the only one struggling to figure things out. I loved the way the author wrote these two characters. They both had flaws, faults, and carried either doubts, guilt, or both. What wonderfully complicated people! I also really enjoyed the thread with Max and Grace. Sometimes their storyline made me want to cry, while at other times laugh at the way things came about. This book and the entire series has so much to offer the reader. These are deep stories, full of very interesting characters and situations. I loved The Wonder of You from start to finish. This is the quality story I have come to expect from Susan– sweetly romantic, faith-driven, family-centered, adventurous, with a few moments that had me chuckling (specifically, a little story about a fort :) ). Amelia is very easy to relate to, I think. She’s the baby sister of the family, wanting prove her independence and just a little intimidated with life at the same time. She wanted adventure and to see the world, but after a not-so-successful photography trip abroad (read: heartbreak), sh This is the quality story I have come to expect from Susan– sweetly romantic, faith-driven, family-centered, adventurous, with a few moments that had me chuckling (specifically, a little story about a fort :) ). Amelia is very easy to relate to, I think. She’s the baby sister of the family, wanting prove her independence and just a little intimidated with life at the same time. She wanted adventure and to see the world, but after a not-so-successful photography trip abroad (read: heartbreak), she’s back in her hometown trying to figure out where she belongs. Clearly, Roark and Amelia draw strength from each other, and could depend on each other. It’s beautiful how he sees her, as herself with all her insecurities, and loves her just as she is. Together, they are stronger. But, with her long-time boyfriend Seth still in the picture, Amelia has to figure out her own heart. Seth is familiar and comfortable, while Roark is new and cultured. (While this was almost a love-triangle situation, it never felt unrealistic or predictable). Roark is a complex character. He seems like the perfect guy from the outside, but carries the weight of guilt and mistakes, with a little bitterness toward God. He wants to start fresh and prove his love to Amelia, but lying to her about his identity is not the best choice. It was one of those “I want to throw your own book at you” type situations. But by the end, thankfully, no one was harmed by my book throwing. I loved catching up with Grace (Amelia’s sister) and Max as a minor secondary story! He still doubts himself and it’s not good for their relationship. Max’s struggle is with choosing life–you can’t let fear control you because you can’t know what the future holds. I like how Susan revisited these characters and renewed some of the same struggles from their story in When I Fall In Love. They are just the sweetest couple. Their storyline really shows how doubt can be unrelenting and not so simple (or fairy-tale-like) in overcoming. This book was absolutely amazing! I loved hearing about the travels and the different competitions that they did. There was so much suspense and I was on my toes the entire time reading this book. This might possibly be my favorite on in this series. I highly recommend it, as well as the reading the whole series. If you know me or have followed my blog at all you probably know that I am a HUGE fan of the Christiansen family! Since book one I have been hooked on this clan of Minnesotan's! What can I say? These books are all AMAZING plain and simple and if you haven't started this series yet, what on earth are you waiting for?! Needless to say this book most definitely did not disappoint! I admit, love triangles are usually not my thing, and if it happens to be a triangle where the girl has to choose betwe If you know me or have followed my blog at all you probably know that I am a HUGE fan of the Christiansen family! Since book one I have been hooked on this clan of Minnesotan's! What can I say? These books are all AMAZING plain and simple and if you haven't started this series yet, what on earth are you waiting for?! Needless to say this book most definitely did not disappoint! I admit, love triangles are usually not my thing, and if it happens to be a triangle where the girl has to choose between the hometown guy and, say a European gentleman, I will almost always find myself rooting for the hometown guy, however with this book I felt the exact opposite way! Roark made me melt, need I say more?! I will always fall for a hero who believes himself unworthy of love, and realizes over the course of the story that he is absolutely worthy of love he just has to be willing to receive it, and watching Roark come to that realization after all he had been through was incredibly touching. So far I have been able to see pieces of myself in all three of the Christiansen sisters though I think there are a few areas in which Amelia is the most like me. I also loved the suspenseful parts scattered throughout as well as at the end, I think I was holding my breath (Figuratively, not literally, obviously!) for most of the last three chapters! There was also a huge plot twist at the end that made me yell "WHAT?! Oh. My. Gosh! No way!!! This can't be happening!!!" But you'll have to read the series, particularly book four which is Casper's story (And my personal favorite of the collection so far) to understand what I'm talking about! I just can't say enough good thing about this series but on second thought I don't have to, their absolute brilliance speaks for itself! This entire series would make perfect summer reads, seriously you (yes, you) need to read this series immediately, you will not regret it! Thank you so much to the publisher, Tyndale house for sending me a copy of this book in exchange for my honest review, which I have done. Oh my goodness. This book was amazing. Seriously, amazing. I don't know what it is about Susan May Warren's books, but nearly all of them seem to capture my attention, tug on my emotions, and make me want the book to never end. The Wonder of You was no exception. I've been loving this series and yet when I started this book I thought I wouldn't care for the romance (I mean, with what I knew of Roark, he just didn't seem that likeable). But, I absolutely loved the romance and even though there was Oh my goodness. This book was amazing. Seriously, amazing. I don't know what it is about Susan May Warren's books, but nearly all of them seem to capture my attention, tug on my emotions, and make me want the book to never end. The Wonder of You was no exception. I've been loving this series and yet when I started this book I thought I wouldn't care for the romance (I mean, with what I knew of Roark, he just didn't seem that likeable). But, I absolutely loved the romance and even though there was a love triangle, I didn't mind it because it seemed believable and genuine. The side story of Max and Grace was crazy and yet one scene especially was quite funny, because of the misconceptions. ;) Other things in the book, though, were heartbreaking and I just hoped that everything would work out alright. All in all, I loved The Wonder of You! I completely recommend this series and I can't wait to read the last book, although I am somewhat dreading it because then the series will truly be over. Best novel in this series so far!! I enjoyed every second of this wild ride. The author made me laugh-out-loud with her well timed humor, bit my nails in the suspenseful parts and smile the rest of the time because I was having so much fun! What made it so much fun? Glad you asked! The book (before this one) Always on My Mind ended in a major cliff hanger. The featured children in that novel were Raina and Casper as they navigate their relationship and find themselves on a treasure hunt. In the m Best novel in this series so far!! I enjoyed every second of this wild ride. The author made me laugh-out-loud with her well timed humor, bit my nails in the suspenseful parts and smile the rest of the time because I was having so much fun! What made it so much fun? Glad you asked! The book (before this one) Always on My Mind ended in a major cliff hanger. The featured children in that novel were Raina and Casper as they navigate their relationship and find themselves on a treasure hunt. In the middle of this adventure Amelia comes home from her European studies. Not much is mentioned about being there except the fact that a boy broke her heart. On the last page of that story a man named Roark knocks on the Christiansen Family lodge and wants to talk to Amelia. He says, “I came to say that I can’t get you off my mind. I love you terribly. Please won’t you give us another chance?” The novel ends! What???? I was beyond thrilled to read about Amelia’s adventures in this book. Roark makes his intentions clear and will not be run off by Amelia’s brothers this time. Roark has competition for Amelia’s affections. Seth, who has been in love with her since the 7th grade. The Christiansen family expected Amelia to settle for him; it was only natural. I enjoyed the process in which all three of these characters went about trying to figure out God’s will for their lives. I also liked hanging out with all of the Christiansen’s. Owen has been missing from the last two books. No one seems to know where he is. The main focus is on Amelia, Roark and Seth but Grace and Max have a good part of this book too. They both have surprised their family with a visit and run into a few surprises of their own. Everyone in this novel is struggling to do the right thing. The reader gets a peek at how different people seek to do what is best for their family and situation as they press into hearing from God. This story encouraged my faith, I liked hanging out at the Evergreen Resort and the family that runs it. This rich story touched my heart and soul. This novel ended in a cliff hanger! I look forward to read the next installment. This is a great novel for book club. There is so much in this to discuss and the author includes discussion questions. You can read this story as a standalone and then catch up with the rest of the series. You won’t feel lost. I highly recommend this book and series is a keeper! Disclosure of Material Connection: #AD Sponsored by publisher. It’s so hard to write a review when words are not enough for expressing what a book did for you. The Wonder of You by Susan May Warren reminded me why I love so much reading. It’s awesome when you find such a masterpiece that you can connect with and the Lord speaks to you through it so clearly. I’ve always loved the Christiansen Family Series, but this has touched me more deeply than any other (even more than ‘It Had to be You’ which has It’s so hard to write a review when words are not enough for expressing what a book did for you. I’ve always loved the Christiansen Family Series, but this has touched me more deeply than any other (even more than ‘It Had to be You’ which has been my favorite for so long). I saw myself struggling with the very same issues Amelia did -not the love triangle, thank God- but the feeling of failing yourself and being so scared of another failure that you decide to stop pursuing your dreams and settle. It’s really easy to identify with her. The author created a character you could actually relate with. Dialogues are great! Funny, interesting, thoughtful. Absolutely great! The second plotline, Max and Grace’s, was so sweet. I was excited with them just as I was with Amelia-Roark-Seth story. I think that’s hard to do because the reader usually wants to know more and more about the main plot, but I didn’t have that problem here. Good thing about the Christiansens is that they’re real, they deal with everyday situations. What bothered me a little was how the whole romance triangle was dealt with. It might be only old-fashioned me, but I did not agree with some decisions Amelia made about Roark and Seth. Nevertheless, I’m grateful for this book. It’s truly Christian. You can see in every page the fingerprint of someone who has walked with God. It’s birthed to bless people and make them know they can be brave in God, which I’m planning to be. Amelia Christiansen has returned from Europe with a broken heart. She isn't ready for the adventures that life wants to give her. She certainly doesn't expect to see the man who broke her heart appear on her family's doorstep with an apology. Roark St. John is the heir to an European hotel dynasty. He's spent the last several years roaming from location to location hiding from his past. When he met Amelia, he wanted to stop running. After breaking her heart, he knows that he has no choice but to Amelia Christiansen has returned from Europe with a broken heart. She isn't ready for the adventures that life wants to give her. She certainly doesn't expect to see the man who broke her heart appear on her family's doorstep with an apology. Roark St. John is the heir to an European hotel dynasty. He's spent the last several years roaming from location to location hiding from his past. When he met Amelia, he wanted to stop running. After breaking her heart, he knows that he has no choice but to follow her and seek her forgiveness and hopefully a second chance. Amelia's torn between Roark and her high school sweetheart who makes it known that he wants to get back together with her. Will Amelia figure out that her own place in the world may need her to find her wings and fly? I've loved each book in this series. This one is no different. It's helpful to read the series in order, though it is not necessary. I LOVED Roark! I loved how he pursued Amelia. I also loved how he was willing to change once his faults were brought to his attention. And Amelia, she's not my favorite of the siblings, but I did enjoy her. I did not like Seth, Amelia's high school sweetheart. I found him to be overbearing and rude. As I was reading I kept asking myself what did she see in him. The Christiansen family hasn't had an easy go of it. And this book shows Casper heading off to find Owen, the youngest brother, while the rest of the family deals with the bombshell of Grace's elopement. But I love how they come together as a family and support one another. Fans of this series will love it. I received this book for free from Tyndale House Books for the purpose of reviewing. My thoughts and opinions are my own. The emotion that makes me connect with the characters is the biggest reason I'm in love with the Christiansen Family series! Amelia doesn't know where she fits in the world or what she wants out of life. It was hard to see her waffling between the choices she saw for herself- hometown settling or unknown adventure, Seth or Roark. She wants to follow God's will for her life, but how does she know what that is when both paths are good ones? Her questions and hesitancy are no doubt elements that ma The emotion that makes me connect with the characters is the biggest reason I'm in love with the Christiansen Family series! Amelia doesn't know where she fits in the world or what she wants out of life. It was hard to see her waffling between the choices she saw for herself- hometown settling or unknown adventure, Seth or Roark. She wants to follow God's will for her life, but how does she know what that is when both paths are good ones? Her questions and hesitancy are no doubt elements that many readers can relate to. Roark has his own traumatic history to overcome, and Amelia's strength and faith lead him to search for peace. It was interesting how he is initially perceived as the bad guy, but one by one the family warms up to him as his admirable qualities are given a chance to shine. Amelia and Roark share several memorable experiences in Deep Haven that remind them why they fell in love and also see hidden strengths that deepen their relationship. A secondary plot that is incorporated is the struggles of Max and Grace from When I Fall in Love. Max's hereditary gene for an incurable disease prevents him from wanting a family, but hates to deprive Grace of that life. A Ukranian orphan finds herself in temporary custody of the Christiansens and both Max and Grace have the opportunity to glimpse the love and sacrifice children would bring into their hearts. I highly recommend reading this series! I've rated all of the books (including novellas) 5 stars, and I while I love a good deal, they are definitely worth paying full price for! They can be read as stand alones but for full enjoyment read them in order. This is one of my very favorite Christian fiction series. Susan May Warren has created a fantastic family with this series. I love each book--catching up with old characters who seem like family and finding out more about one particular family. Amelia was sometimes annoying. I liked her as a minor character in other books, but when the last book in the series was about a guy who will probably die a painful death, it was hard to care about her having her feelings hurt because she misinterpreted R This is one of my very favorite Christian fiction series. Susan May Warren has created a fantastic family with this series. Amelia was sometimes annoying. I liked her as a minor character in other books, but when the last book in the series was about a guy who will probably die a painful death, it was hard to care about her having her feelings hurt because she misinterpreted Roark's actions. However, I LOVED him. He was a great character, and I hope he's around in the next book. Although Max and Grace weren't the main focus in this book, their continued story was my favorite part of this book. I loved the change in Max...don't want to spoil it, but it was fantastic. Overall, this is a great continuation of the series. Not the best in the series but another solid book. In the realm of inspirational fiction, family sagas are currently enjoying popularity. One of those series is penned by award-winning author Susan May Warren, who took on the challenge of writing about more than the typical three siblings (three book series). Her world features a family of six. This is the next to last book which takes us on “baby” sibling Amelia’s journey. Her story was teased at the end of Always on My Mind. In fact, it was such a good here’s-what’s-to-come (because anytime yo In the realm of inspirational fiction, family sagas are currently enjoying popularity. One of those series is penned by award-winning author Susan May Warren, who took on the challenge of writing about more than the typical three siblings (three book series). Her world features a family of six. This is the next to last book which takes us on “baby” sibling Amelia’s journey. Her story was teased at the end of Always on My Mind. In fact, it was such a good here’s-what’s-to-come (because anytime you hint at a British hero, I’m in) tease that I couldn’t wait to get my hands on this beauty. Returning to this haven that the Christiansen family calls home to catch up with this family is always a pleasure. Giving Amelia a British gentleman intent on proving himself to her? That’s icing on the cake. Amelia’s story picks up after she returns from overseas having felt betrayed by Roark. But little did she ever dream he’d follow her to the north woods of Minnesota nor does she know just who Mr. St. John really is. Stripped down to its most basic heart, Amelia’s story is lovely. I enjoyed the slow building her relationship with Roark enjoys and since they already have a history, everything that goes down in her hometown is easy to accept without suspending our believable meter of truth. Amelia, I think, is actually one of my favorite siblings. She’s young yet, but there’s so much maturity and wisdom in that head of hers. But… getting the “bad” out of the way, I think the only facet of the story that I didn’t completely enjoy was the “competition” involved in the love story and by proxy, Amelia’s flip-flopping emotions. I don’t want to give anything away which is why I probably shouldn’t say much more, but there is something left to be desired about certain events that take place… and that’s really all I can say. A lot takes place in a limited number of pages (there’s a 60+ page discrepancy between the ARC and finished copy). Life or death situations present characters with choices they’d rather run from (often with the end result of God convicting them). There’s an emotional upheaval kind of story going on in Grace and Max’s life, experienced through Max’s viewpoint. I always did find their story particularly heart wrenching (in a good way, if that makes any sense) and being able to walk with them for a short time in this new season was really sweet. Never fear, there is lots of joyful interactions between Amelia and her suitor, and I must say, Roark just might be my favorite character vying for the heart of a Christiansen yet. 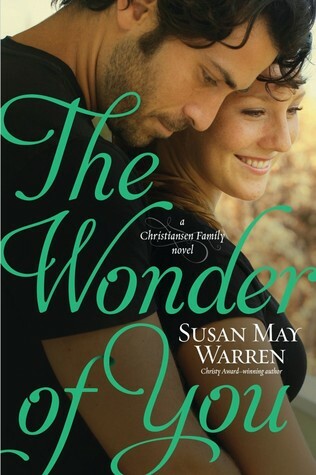 A sweet contemporary novel that uses the strength of family, love and God to shine, The Wonder of You falls easily into line as another special kind of story from the pen of Susan May Warren. With each proceeding novel before this, there have most likely been challenges for each story, but I think the author saved the most challenging for last. Why? Because it’s to be Owen’s story and with his checkered past – part of which hits very close to home, I suspect his will be a special kind of redemption story. Welcome back to Deep Haven! I love this series, it just gets better and better with each book! It feels like coming home reading about the Christiansen family, this time with the focus on the youngest daughter, Amelia. Grace and Max Sharpe's relationship is an interesting feature also. The feeling of failure, and the fear of making a wrong choice seems to have followed Amelia home to Deep Haven from her time in Europe. The decision to follow her fickle heart or do what seems to be the most rati Welcome back to Deep Haven! I love this series, it just gets better and better with each book! It feels like coming home reading about the Christiansen family, this time with the focus on the youngest daughter, Amelia. Grace and Max Sharpe's relationship is an interesting feature also. The feeling of failure, and the fear of making a wrong choice seems to have followed Amelia home to Deep Haven from her time in Europe. The decision to follow her fickle heart or do what seems to be the most rational plan--and safe one--has her vacillating between two beaus. Finally realizing the right choice only reveals itself when the focus is on God comes to her after it's almost too late. Loved all the inspirational threads in this book, like using the hymn Be Thou My Vision, and the story of Jonah, to show how God pursues His people and loves them unconditionally. It was great to have so many returning Deep Haven characters taking active parts in the story too, and have them come alongside Amelia and Roark, giving wise counsel and Biblical insights. Wished I could sit down and talk with Ingrid, John, Pastor Dan or Ivy sometime. Some of their conversations made me cry they were so good. That's one thing that stands out in this author's writing, how real the people seem and how insightful the dialogues can be without every feeling maudlin or trite. Have to love the lumberjack activity in there too--can just about hear the whine of the chainsaws and smell the sawdust! Highly recommend this whole series! Best read in order, but may be able to read as a standalone if you don't mind feeling like you've dropped into a family reunion where you don't really know anyone. An absolutely "brilliant" addition to this wonderful series! Double trouble. Amelia Christiansen has it. After returning home prematurely from what was to have been a year abroad, Amelia finds herself vigorously pursued by her high school sweetheart, Seth Turnquist and face-to-face with a man who has travelled across an ocean to find her, Roark St. John. Amelia has known Seth her entire life; he is a safe choice, loved and admired by family and friends; plus, he insists that they have always belonged together, forever, in Deep Haven. Roark, on the other h Double trouble. Amelia Christiansen has it. After returning home prematurely from what was to have been a year abroad, Amelia finds herself vigorously pursued by her high school sweetheart, Seth Turnquist and face-to-face with a man who has travelled across an ocean to find her, Roark St. John. Amelia has known Seth her entire life; he is a safe choice, loved and admired by family and friends; plus, he insists that they have always belonged together, forever, in Deep Haven. Roark, on the other hand, has traveled the world, but has a way of drawing Amelia to himself like no one she has ever known. Except, he broke her heart in Europe and she is not sure that he takes their relationship seriously, until he literally moves to Deep Haven, insisting that she give "them" a second chance. Upon one condition, Roark must find a way to be truthful with Amelia without revealing all of his secrets at one time. And he has billions of them. Vowing to give both men a chance, in the end Amelia must re-examine her own heart; first of all, envisioning God's plan for her life and then determining which, if either man, is a part of that future. God in His faithfulness, and rather dramatically, makes His choice very plain. Even though Amelia learns how fragile life itself can really be. Enjoy this beautifully written addition to the acclaimed Christiansen family series. THE WONDER OF YOU is Ms. Warren’s most recent books. I’ve been a long time fan—my favorite writer—of her stories so I was looking forward to reading this book. It is the fifth book in The Christiansen Family series, but it does stand alone, though the stories are intertwined some. Amelia believes she is weak and a failure since she went home to Deep Haven. She felt betrayed by Roark and now trapped in Deep Haven, working as a maid for her brother at the family resort. Her high school boyfriend is waiting in the wings tempting her with an idyllic dream, complete with marriage and a bunch of children. But Roark isn’t so willing to give her up. He trails her across “the pond” and takes a job at the local coffee shop and is willing to do whatever it takes to show Amelia that he can fit in Deep Haven… even if it means making a fool of himself. I loved, loved, loved this story. At first I wasn’t totally sure who Amelia would choose. Seth is a dear, too, if a bit territorial, and I hope Ms. Warren plans a story for him. I can’t wait to read the sixth—and final—book in The Christiansen Family, You’re the One I Want, coming in 2016. An excerpt is included at the end of THE WONDER OF YOU and I read it—something I rarely do. Discussion questions are included, too, making this ideal for a book club. Susan May Warren's talent is undeniable and her stories irresistible. One of the best things about this book is the family dynamics and the ongoing saga of the entire family. The Wonder of You is spectacular in its faith-driven message. I'm really looking forward to Owen's story. All books in this series can be read in order, though to truly appreciate all the characters and the family, it would be best to read the series in order. Roark was introduced in book 4, especially the in the epilogue. First introduction didn't leave me liking him a lot, but that all changed with the first pages of this story. Roark stole my heart and I was team Roark all the way. I enjoyed the romance and the love-triangle was interesting in the beginning, but then it started to feel dragged out All books in this series can be read in order, though to truly appreciate all the characters and the family, it would be best to read the series in order. I enjoyed the romance and the love-triangle was interesting in the beginning, but then it started to feel dragged out and a bit annoying. Where I felt for Seth in the beginning, I started to dislike him when he began to act like Amelia belongs to him etc etc. The brokenness of Roark drew me to him. I loved to see how his character grew and the truths he realised about himself and God. I loved the secondary plot about Max and Grace. Their love story was emotional and it continued in this book. What I also loved, is the suspense at the end and especially the twist in the epilogue. To truly understand that book 4 needs to be read before book 5. I have read all of Susan May Warren’s books, including all the Christiansen’s family series. After finishing Casper’s story in Always on My Mind and being introduced to Amelia near the end, I couldn’t wait to dive right into Amelia’s story in The Wonder of You. True to the contemporary romance, Warren created everything I love about her writing and then some. Great descriptive setting, heart-pounding romance, and page-turning tension with wonder—I literally could not put this book down. The writi I have read all of Susan May Warren’s books, including all the Christiansen’s family series. After finishing Casper’s story in Always on My Mind and being introduced to Amelia near the end, I couldn’t wait to dive right into Amelia’s story in The Wonder of You. True to the contemporary romance, Warren created everything I love about her writing and then some. Great descriptive setting, heart-pounding romance, and page-turning tension with wonder—I literally could not put this book down. The writing was tight, interesting, and grammatically sound with a nice balance between the internal monologues and the actual conversation between the characters. Once again, Warren creates life-like characters that jump off the page. I felt Amelia and Roark’s struggle as they debated between the fling they had in Prague versus the reality of their normal situations. I enjoy watching Amelia and Roark interact and liked them instantly. Warren has definitely created memorable characters who fill the dining room table at the Christiansen family’s dinners. The supporting cast was members that, as an avid reader of the Christiansen family series, I have come to know and love. I enjoyed how Warren is continuing the family saga for my and tons of readers’ enjoyment. The pace and flow was just right for this type of book. I enjoyed how Warren weaves the romance affecting Amelia and Roark into modern day story of chivalry who had to fight for the woman’s hand. It was unique, totally unpredictable and gripped my attention from the opening chapter. Warren did a good job in this book, which is a great addition to the Christiansen family saga. While Amelia jumped between the affections of Seth and Roark, it flowed naturally over the course of the story and provided plenty of sparks and attraction to appeal to majority of contemporary romance fans. One of my favorite aspects of Warren’s writing is her ability to draw her readers into the story world. The story takes place in Deep Haven, Minnesota, which is a fictional town in northern Minnesota. I loved how this makes the twelfth book which takes places in this fictional town. Warren showcases her love for the Minnesota wilderness and the characters who populate this small town set against the crisp waters of Lake Superior. Her setting shines on every page with Warren’s attention to the tiniest detail like the wind whistling through the pine trees. I felt like I was in Deep Haven. Warren allows John, the paternal head of the family, to convince Roark to change by allowing him to truly grasp that God wants everyone to obey Him, not because of what God has given you, but simply because he asked. This is a hard lesson for everyone to believe, but Warren weaves this spiritual truth through the conflict on the pages and in the lives of Amelia and Roark as they struggle with their romantic entanglements. Warren does not preach at the audience. It came across natural sounding and fit the proper moment at the climax. This book will appeal to readers of all ages. There is nothing questionable about the content. I believe it is a great tale for the younger ladies to read and discuss how true love should act. True love is worth fighting for. Fans of Nicholas Sparks, Becky Wade, Melissa Tagg, Beth K. Vogt, and other writers of contemporary romance will enjoy The Wonder of You. Susan May Warren is an outstanding author! The words flowed smoothly and the characters interacted quite naturally. Tension felt palpable when it needed to, and witty humor deflated some of the angst when appropriate. Books like this are truly a pleasure to read. Roark was by far my favorite character – and not just for the obvious dreamy-sigh reasons. Although… a *dreamy sigh* or two would not be amiss. Flawed but sincere, he earnestly loved Amelia and was determined to win her back. (Whether th Susan May Warren is an outstanding author! The words flowed smoothly and the characters interacted quite naturally. Tension felt palpable when it needed to, and witty humor deflated some of the angst when appropriate. Books like this are truly a pleasure to read. Roark was by far my favorite character – and not just for the obvious dreamy-sigh reasons. Although… a *dreamy sigh* or two would not be amiss. Flawed but sincere, he earnestly loved Amelia and was determined to win her back. (Whether this works out for him or not, I won’t say. You’ll have to read the book to find out!) He didn’t care if he made a fool of himself or gave up everything – he just wanted the chance to prove himself. Plus, you know, he has the British accent sooooo… Yeah. I did not, however, care for Amelia’s actions much of the time. I liked Amelia – her personality, her quirks, her heart. But I felt she was pretty immature in the way she treated both Seth and Roark. She would tell one man that she loved him, then encourage the other almost the next day. Granted, she is only 20 and that’s something I had to keep reminding myself as I read through the book. However, I had to remind myself of that so often that, to me, it seemed more of a character flaw than merely an age issue. I have to admit too that I was at a slight disadvantage to begin with as I have not read any of the other books in the Christiansen family series OR the Deep Haven series. I know, I know. And I call myself an avid reader? In the beginning, I was a little lost since apparently the previous book had ended with Amelia returning home and Roark coming after her (the first time) only to be run out of town by her over-protective brothers. This was referenced in discussions with her friends and eventually explained fully – so I felt less lost – but at first I was confused. (My own fault – I should have read the other books lol. I will correct this oversight at the next available opportunity!) Also, there is a lot of backstory to the other characters that is hinted at and would probably have been better understood had I read the other stories. Therefore I would recommend that, while this book can be read as a stand-alone, you should probably read the series from the beginning if you haven’t already. Finally, the part of the story involving the Christiansen family et. al. ends on a bit of a cliffhanger that I’m sure acts as a set-up for the next (and final) book due out in early 2016. If you like series set in small towns and/or series that follow a particular family, you will really enjoy the Christiansen family series. I myself am looking forward to going back and playing catch up now that I’ve fallen in love with all the characters – I want to know their stories! Well, I can say for sure that Susan May Warren books never,ever disappoint. The Wonder of You is the 5th book in the Christiansen Family novels and Amelia's story. Amelia is the youngest and everyone has always spoiled and protected her. Anyone who has read this series will remember at the close of the last book, Always On My Mind, Amelia returned home early from her European adventure, withdrawn. Then Roark St. John showed up and apologized to her, only to be driven away by her brothers and fat Well, I can say for sure that Susan May Warren books never,ever disappoint. The Wonder of You is the 5th book in the Christiansen Family novels and Amelia's story. Amelia is the youngest and everyone has always spoiled and protected her. Anyone who has read this series will remember at the close of the last book, Always On My Mind, Amelia returned home early from her European adventure, withdrawn. Then Roark St. John showed up and apologized to her, only to be driven away by her brothers and father. Well, Roark comes back to Deep Haven, convinced that Amelia is the one for him. If only Amelia would cooperate. Seth Turnquist also has loved Amelia forever and wants her to be his bride. Roark is heir to a vast fortune in the Constantine Hotels dynasty, but he is dealing with and haunted by tragedy, not sure what his life holds or what he is supposed to do. Roark has been from one country to another, never knowing how to stop running, But Amelia has given him a reason to stay put. Amelia is doing a bit of her own running, too. From God. Unsure of what decision she should make, but feeling something way down deep in her heart that won't quite let go, Amelia is confused and hurt by what she feels are lies Roark has told her. This was an amazing 5th book in this series. I love Deep Haven. I want to go visit. I want to stay a while in this tiny hamlet in the north woods of Minnesota. Susan May Warren has created characters and locales that not only enter the imagination of the reader, but take root and become very nearly a reality. I desperately sometimes want to be there and visit with all these people. Seriously. I really do. That's how good this writer is. When I have to put the book down to return to my regular life, I think about it and can't wait to pick it back up again. I also love how Susan lets us visit with and catch up with the characters from previous books. The secondary story line she gives to Max and Grace just blew me away and had me in tears, sobbing, even, at times. In fact, I wept more than a few times during this book. And the ending was sublime. Pure wonderful. Next up is the last book, Owen's story. Owen, the prodigal. I cannot wait to see how Susan reaches him for Christ. This book has a powerful spiritual message running throughout, as do all her books. I appreciate so much her ability to include this in her books and her bravery in taking a deep stand for Christ in her books. Some Christian authors do not. God loves us even when we don't love or believe in ourselves. He's waiting, arms stretched out, ready when we decide that His plan is best. What a wonderful life we have in Christ! The overarching theme in The Wonder of You is pursuing the life God has called you to, wherever that may be and however that life may look. After returning home from Europe with her heart broken, Amelia wonders if God's plans for her really include more than Deep Haven. Maybe she should settle down with Seth, her high school boyfriend, and live out her days in Deep Haven. But her heart continues pulling her toward Roark, even though she's not sure she can fully trust him. She struggles to underst The overarching theme in The Wonder of You is pursuing the life God has called you to, wherever that may be and however that life may look. After returning home from Europe with her heart broken, Amelia wonders if God's plans for her really include more than Deep Haven. Maybe she should settle down with Seth, her high school boyfriend, and live out her days in Deep Haven. But her heart continues pulling her toward Roark, even though she's not sure she can fully trust him. She struggles to understand what God wants for her. Max Sharpe, Grace Christiansen's fiance, also struggles to understand God's plan for his life. Knowing he faces declining health and eventually death due to Huntington's disease, he decided that children could not be in his future. But when an orphan practically falls into Grace's lap, Max begins to realize that God may have something bigger in mind for him and Grace. I love the way that Susan May Warren seamlessly weaves spiritual truth into a completely gripping family drama. One thing that has stuck with me, even several days after finishing the book, is a conversation that Amelia has with her best friends about following God's call. One of her friends says that if God called her to missions, she would just say no—after all, people say no to God all the time. That got me thinking—in what ways have I said no to God, and how much richer would my life be if I had said yes? Food for thought, for sure. Of course, I enjoyed the novel for more than the deep thinking it provoked! The romance between Amelia and Roark was sweet (if a bit frustrating at times), and I loved how Roark fit into the Deep Haven community. I also enjoyed looking in on most of the other Christiansens again, as well as Jensen and Claire (from Take a Chance on Me). Though it was the "B" plot of the novel, I absolutely adored the story surrounding Max and Grace. They are my favorite of the couples so far, so I was thrilled to jump back into their story and see how their relationship progressed since they fell in love in When I Fall in Love. I feel like a broken record whenever I review one of the Christiansen Family books because I have only good things to say about them! This is a series that you absolutely don't want to miss, and The Wonder of You is just as gripping as all the preceding books in the series. I love Susan May Warren's books. When I get one of her books any others are quickly placed back on the to-be-read pile so I can start reading hers immediately. The Wonder of You did not disappoint. Roark St. John has returned to the town of Deep Haven determined to recapture the heart of Amelia Christiansen, the heart he broke during their time in Europe. But regaining her trust won't be easy, especially with the home-town competition of lumberjack Seth. Roark will have to exchange his Ferrari a I love Susan May Warren's books. When I get one of her books any others are quickly placed back on the to-be-read pile so I can start reading hers immediately. The Wonder of You did not disappoint. Roark St. John has returned to the town of Deep Haven determined to recapture the heart of Amelia Christiansen, the heart he broke during their time in Europe. But regaining her trust won't be easy, especially with the home-town competition of lumberjack Seth. Roark will have to exchange his Ferrari and expensive French cuisine for a chainsaw and s'mores if he has any chance of proving to Amelia that she is the girl for him. We haven't seen a lot of Amelia in the previous Christiansen series books. From the last book we know that she has been living in Europe, recently Prague, but has returned home disappointed and broken hearted. And then, right at the end of Always On My Mind (the previous book) a mysterious gentleman appeared asking for a second chance. We know no more and I've been very keen to read about Amelia, her time in Europe and her mysterious beau (or ex-beau, as the case may be). While the book takes place in Deep Haven we are given short flash-backs throughout the story of Amelia's European travels and how she met and first fell in love with Roark. While there is a bit of a love triangle, of which I'm never usually a fan, it never felt overplayed or too cruel. Roark is particularly charming, yet also vulnerable about his past and Seth is everything you could want in a small-town hero. This book felt like an emotional roller coaster, one minute I wanted to shake a character or I'd put down my reader in frustration or agony only to quickly pick it up and keep reading because I love it, I love them and I just had to know what was going to happen. The Christiansens are one big crazy family and while reading the books in this series I have the privilege of feeling like an honorary member. I love how in this series you get to keep up with the whole Christiansen family and other members of the Deep Haven community, many of whom readers will know from Susan May Warren's previous books. In The Wonder of You, I particularly enjoyed the focus on Grace and Max, who have some big surprises in store. And wow, what an ending. There is a huge twist which sets up the next book, which is sure to be just as loveable and enjoyable as this one. Double the romance and double the angst makes for a tummy churning read packed with lots of emotion. Not only do we get Amelia and Roark's tumultuous romance but a continuation of Max and Grace's love story carried over from When I Fall in Love. And once again I came away from the read with a bruised heart that still feels tender. And I might currently be hiccupping shuddering sighs after a biblio-induced crying jag. There was one sub-plot that just pushed all my buttons. Sniffle. Oddly enough, t Double the romance and double the angst makes for a tummy churning read packed with lots of emotion. Not only do we get Amelia and Roark's tumultuous romance but a continuation of Max and Grace's love story carried over from When I Fall in Love. And once again I came away from the read with a bruised heart that still feels tender. And I might currently be hiccupping shuddering sighs after a biblio-induced crying jag. There was one sub-plot that just pushed all my buttons. Sniffle. Oddly enough, that leaves me feeling replete. Saturated in the euphoria of true love that comes in many forms -- including from on high. Because one of the things I enjoy the most about Susan May Warren's books is the way she embeds faith into every nuance of the story. It's never overdone, but she doesn't mince words either. Early on in the story, Amelia's mother gives her some sage advice: to center her heart on Jesus and once she does that everything else will come into focus. Ingrid (mom) rocks! I love how she handles her brood of unruly adult children and is quick to provide council when necessary (even when it's unwanted.) And she doesn't pull any punches. Roark is...fainting couch worthy. Tall, dark and handsome with the extra thrill of a James Bond accent. Is it any wonder I fell for him? Or that Amelia did? Twice actually -- once abroad and then all over again when he high tails it to her small town in hot pursuit of the love that got away. Be. Still. My. Heart. Purposeful. Deliberate...Desperate! And wounded. Can we all utter a collective sigh over the deep attraction we feel for a wounded hero? I was cheering from the sidelines the whole read. Amelia is perfectly portrayed as the baby of the family. With all those protective older siblings barely giving her room to breathe, she's had a hard time striking out on her own and lacks in confidence. Except when she's with Roark. But she's conflicted and I'll warn you right now, there's a love triangle that about drove me crazy! Can you say triple angst pile up? I don't think my heart or my pulse will ever be the same. Susan May Warren in her new book “The Wonder of You” Book Five in the Christiansen Family series published by Tyndale House Publishers takes us into the life of Amelia Christiansen. From the back cover: Mortified after her year abroad is cut short, Amelia Christiansen returns to Deep Haven, certain she isn’t brave enough to embrace the adventures she’s dreamed of. The last thing she expects is for the man who broke her heart to cross the Atlantic and beg forgiveness. Heir to a European hotel dynas Susan May Warren in her new book “The Wonder of You” Book Five in the Christiansen Family series published by Tyndale House Publishers takes us into the life of Amelia Christiansen. While one surprise after another leaves Amelia reeling, Roark’s continued presence only highlights the questions pursuing her. Like him, is she running from the life God has called her to? Could finding her place mean leaving home behind? I like Deep Haven. I really enjoy the Christiansen family. I would stay at their Lodge and try to hang out with them. Right now the main focus is on Amelia, Roark and Seth. Both Roark and Seth have been loved by Amelia before and both want to have her now. Amelia, to her credit, wants to level the playing field to see which way, if any, her heart will decide. That is what makes this book so much fun. Obviously there is a whole lot going on in this book. The Christiansen Family are not perfect however they are interesting and I would have no problem having them as my friends. Ms. Warren does a superb job of making each character, especially Amelia, Roark and Seth, come alive so much that they seem as if they have been our friends all our lives. “The Wonder of You” is a wonderful, sweet story with power and depth that will keep you flipping pages. I recommend this book highly and look forward to the next reunion with the Christiansen Family. Finally! I’ve been waiting for Amelia’s story from Susan May Warren’s Christiansen Family series. Now that I’ve finished it, I’m happy and sad. Happy because it’s a great book. Sad because there’s only one Christiansen sibling’s story left. Although it promises to be a whopper. Amelia Christiansen left in a previous book to go to Europe for a year-long photography course. Her parents visited her a few months later and she returned home with them. And with a broken heart. At the end of the last boo Finally! I’ve been waiting for Amelia’s story from Susan May Warren’s Christiansen Family series. Now that I’ve finished it, I’m happy and sad. Amelia Christiansen left in a previous book to go to Europe for a year-long photography course. Her parents visited her a few months later and she returned home with them. And with a broken heart. At the end of the last book, ALWAYS ON MY MIND, the heart-breaker arrived in Deep Haven with flowers and an apology. THE WONDER OF YOU opens a few weeks later. Roark was chased off by Amelia’s protective family and she has slipped back into her role at home as the youngest Christiansen and also slipped back into her role as half of Amelia-and-Seth, her high school relationship. She’s determined to forget about Europe and her dreams and ambitions and to settle in Deep Haven. Except then Roark St. John returns, this time vowing to stay until he convinces her that what they shared in Prague and Paris wasn’t a fling, but the real thing. Warren did a great job. The premise is “will Amelia stay with the man she’s loved since high school or will she leave the safety of home for the man who broke her heart?” I don’t want to give any spoilers, so I’ll say that at first both men seemed evenly matched and I was afraid I wouldn’t know who to root for. But Warren skillfully wove in some details and circumstances that showed who was the right man for Amelia’s heart. I loved this one! And now I’m stuck, once again waiting for the next book in this series. I feel like I’ve been to church! As I read the last 150 pages of Susan May Warren’s newest Christiansen Family novel, The Wonder of You, I kept pausing to pray about the truths contained in its pages, to praise God, to worship Him. I wasn’t praising Him for what He was doing in the lives of a few fictional characters but for what He has done, is doing, and will do in mine. Warren did a beautiful job of showing God’s true nature to her readers through a fictional story. In my mind, that’s what Ch I feel like I’ve been to church! As I read the last 150 pages of Susan May Warren’s newest Christiansen Family novel, The Wonder of You, I kept pausing to pray about the truths contained in its pages, to praise God, to worship Him. I wasn’t praising Him for what He was doing in the lives of a few fictional characters but for what He has done, is doing, and will do in mine. Warren did a beautiful job of showing God’s true nature to her readers through a fictional story. In my mind, that’s what Christian fiction is all about. This fifth book in the series focuses on Amelia, the youngest of the Christiansen siblings, but it’s also a sequel to Grace and Max’s story, told in When I Fall in Love, and a prequel to the final book, You’re the One That I Want, due out in Spring of 2016. (I’m looking forward to that!) In the previous book, Always on My Mind, Amelia had come home from Europe with a broken heart. When the boyfriend who jilted on her showed up on her doorstep, her overly protective family of hockey-playing brothers and brother-in-laws practically sent him running for his life. Now he’s back in Deep Haven, determined to stay, determined to win Amelia’s heart, no matter what. Seth, her high school sweetheart, has his own opinion about that. I loved watching Amelia struggle to discover God’s path for her life. I found Max’s growing understanding about his own condition profound. Roark’s discovery of a lie he’d chosen to believe and the truth he needed to replace it with was one the whole world needs to hear. John and Ingrid were inspirational as they patiently mentored the young adults in their growing clan. I loved this book. Like most of Susan May Warren's books. It's hard for me to review them, because I love her writing style and I always feel so connected to her characters, it's almost like trying to review friends. This one turned out to be a bit different than I was expecting. I kind of expected the posh European hero to come dashing in, save the day, and sweep everyone off their feet. Turns out he, of course, had his own baggage. Watching this story unfold and the way the characters stretche I loved this book. Like most of Susan May Warren's books. It's hard for me to review them, because I love her writing style and I always feel so connected to her characters, it's almost like trying to review friends. This one turned out to be a bit different than I was expecting. I kind of expected the posh European hero to come dashing in, save the day, and sweep everyone off their feet. Turns out he, of course, had his own baggage. Watching this story unfold and the way the characters stretched themselves and grew as people and as a couple was both heartbreaking and fun in turns. I think the thing I love most about Ms. Warren's books is that they're never just a love story, and the couple doesn't necessarily "complete" each other. They learn and struggle with their insecurities and issues, they get right with God, and become complete on their own. And then they learn how to come together and be complete as a couple. I just love that it's not all about solving each other's problems or someone swooping in to save the day. It's about growth and being who you're meant to be, and then also finding an awesome teammate to share life with. It feels more realistic and healthier that way. Ms. Warren is also great at creating lovable characters with struggles that we can all relate to, and seeing them through to a better place. There are always great lessons and truths revealed throughout the narrative. I feel like I've grown a little and learned something myself after reading one of her books. Laughter, tears, romance, faith, family, really this book has it all. it's a great contemporary read. I highly recommend it. This is part of a series, but it does not need to be read in order and each book can easily be read as a standalone. Although I do recommend reading the whole series, because each book awesome. Amelia, the youngest of the Christiansen clan, must find her own voice, dreams, and destiny in this fifth book in the series. All of her life, Amelia's older brothers and sisters have hovered over her and molded decisions for her. However, Amelia has an adventurous spirit and longs to step beyond the bounds of Deep Haven. When she does, she attends a photography course that travels around Europe. While there, she meets Roarke, who she assumes is a professional student. However, Amelia's heart is Amelia, the youngest of the Christiansen clan, must find her own voice, dreams, and destiny in this fifth book in the series. All of her life, Amelia's older brothers and sisters have hovered over her and molded decisions for her. However, Amelia has an adventurous spirit and longs to step beyond the bounds of Deep Haven. When she does, she attends a photography course that travels around Europe. While there, she meets Roarke, who she assumes is a professional student. However, Amelia's heart is broken when she sees Roarke in the arms of another woman. Believing that life outside of Deep Haven is not for her after all, Amelia returns home and falls into the pattern she had before she left, being girlfriend and assumed to be wife of a local firefighter. Amelia's life is upset by the arrival of Roarke who has followed her across the ocean to win her back. He explains that while he was hugging another woman, it wasn't as Amelia assumed. She agrees to see him, provided he doesn't lie to her again. But, Roarke has one more thing he hasn't told Amelia and it's a big one. Another Christiansen sibling has a secret as well, one that she is not being very forth-coming with. And, Casper takes off to find missing brother, Owen. I wish I hadn't read this book before the others, but it was a new arrival at the library and had the soonest due date. I did learn some things that I may have enjoyed learning as the stories unfolded in the other books. What an amazing book. Susan May Warren strikes again. I always have to take a break after reading her books before I can think to write the review. Her stories are so full of emotion and lifelike people that you just want to take home with you and never let them go. I am so NOT looking forward to the series ending next year with Owen's story. And I just knew that dead body was going to come back to bite someone! Before we get to the real story, I have to say that this book also dealt a lot with Grace and Max and it was the perfect stories to blend together. Max and Grace have a surprise and it is agony waiting with them for the right moment to reveal it. Their struggles became my struggles. Their victory, mine! Okay, so Amelia went to Europe and brought heartache back with her. Then Roark came chasing after her only to be run out of town by her family. But now he's back and determined to win Amelia back. At the same time, Amelia's high school sweetheart is ready to win her back too. So a lot of the story is Amelia's struggle of what to do with her life and which of these two great guys is she meant to do it with. There's a lot of testosterone floating around. And money. And egos. There's half truths and secrets that may affect answers if they were known. Just a lot of messed up thinking. My favorite part is when Ingrid tells Roark that "He loves us simply because He finds joy in loving us." I have absolutely loved this series! And The Wonder of You does not disappoint! Warren per her usual style, types up a story you want to dive into and stay immersed in. I only wish I could have read it in one setting, but being the mom of three little kids, and one being a newborn, that was not possible. Still I devoured it as I could over 2 days. Amelia, Roark and the Christiansen clan, all make for an engrossing tale. With depth of characters & relationships, struggles, insecurities, hurts and yes, pride... they like the rest of us struggle through circumstances, doubts, hopes, dreams and fears. Warren again inserts several biblical lessons that ring true and are done in a touching and heartfelt way. I love that about her novels. And this was definitely one that pulls at your heartstrings! Seeing Amelia navigate the waters of her fears and feelings, amongst her family and even more in her choice of who is best for her between her two suitors was well worth the read. And you can't help but root for 007! Truly a hero that can win your heart. Although I have a degree in Mass Communications from the Unive I can't help be amazed at the gifts God has delighted me with - a wonderful husband, four amazing children, and the opportunity to write for Him.